Hillsborough, NJ • March 27— Flounder Brewing was named one of the fastest growing small and independent craft breweries of 2018 by the Brewers Association (BA)—the not-for-profit trade group representing small and independent craft brewers. The second annual list offers insight into the depth and diversity of growth within the craft brewing industry. 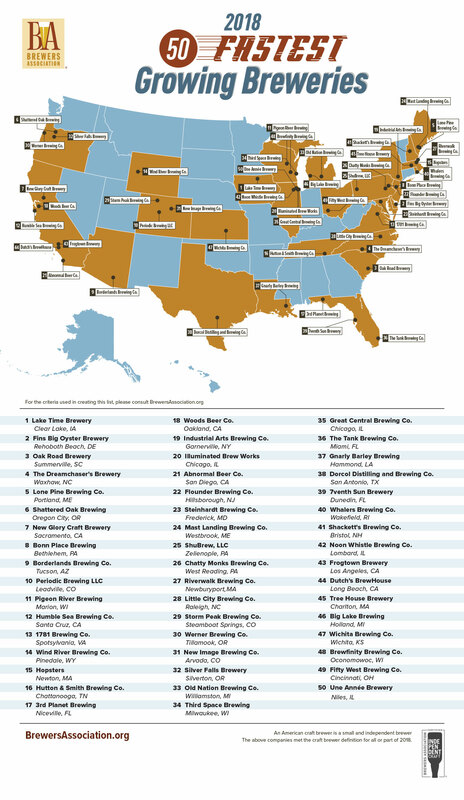 Flounder Brewing was ranked 22 among 50 small and independent breweries from across 27 states. Median growth from all the breweries on the list was 163 percent with the median size being 1,350 barrels of in-house production in 2018. Breweries on the list range from 50 barrels to more than 40,000 and grew from less than 70,000 barrels collectively in 2017 to more than 170,000 barrels in 2018. As a group, these brewing companies represent approximately 10 percent of total craft growth by volume for the year and include 13 brewpubs, 35 microbreweries, and two regional craft breweries. Flounder Brewing is a 3 bbl brewery located in Hillsborough, New Jersey. The brewery first opened in 2013 by Jeremy “Flounder” Lees, his brother, Daniel Lees, and cousin, Billy Jordan. At the start, the family was only brewing 31 gallons of beer per batch and open every 6 weeks. Things started to take off after Jeremy left his full-time job to turn his dream into a reality. Near the end of 2017, the brewery was able to hire six employees, including Doug Duschl, their full-time Head Brewer. With the help of their Head Brewer, they started brewing at max capacity of 186 gallons per batch. In 2018, their team grew by 100%, they started opening four days a week for fresh beer to go, and increased their self-distribution footprint. With all of the success the brewery was experiencing, it was evident to Jeremy and his team to start thinking about expansion. That’s when Jeremy set his eyes on the beautiful Carriage Farm, the future home of Flounder Brewing, in Hillsborough, New Jersey. Planning is already underway and in 2020, Flounder Brewing will be a 10 bbl brewery and occupy a picturesque 5,500 sqft barn. Flounder Brewing’s mission is to offer fresh and local craft beer in a family-friendly environment that offers a unique experience to its visitors.